This photo is so fascinating, and I can't quite articulate why. 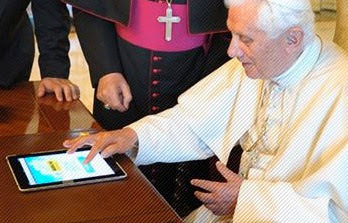 Pope Bendict XVI, using an iPad 2 and quite obviously on Twitter, to "tweet" a brief message to inaugurate the Vatican's official news site. And what was the Holy Father's first message in 140 characters or less? "Dear Friends, I just launched News.va Praised be our Lord Jesus Christ! With my prayers and blessings, Benedictus XVI"
Click here for SQPN's report on Pope Benedict's first tweet. And thanks to Fr. Roderick Vonhögen for the heads-up! I wonder if he'll snag "Plants vs. Zombies" as well?